Once again, VPR has partnered with The Castleton Polling Institute to conduct our latest in a series of polls of Vermonters. This latest poll was conducted from July 11 to 23, 2016. The poll interviewed people from around the state, calling both cell phones and land lines. You can download the full results of this poll, including the datasets (in XLS format) and American Association for Public Opinion Research Transparency Initiative Details (Appendix A), detailing the methodology, sampling error and survey instrument (i.e. the questions). Note About Margins Of Error: From the poll methodology, "the total number of completed interviews is 637 (308 landline and 328 cell phone)" and "the margin of error is (+/-) 3.9 percentage points at the 95 percent confidence level for data representing the entire sample." Please note that where results are broken down further, e.g. by age, gender, party, etc., the sample sizes are smaller and therefore the margins of error are greater. For example, the margin for the full results is 3.9 percent, however when you look at results by gender the margins of error increase to 5.2-5.8 percent. See Appendix A for full details. What do you think is the most important problem facing the state of Vermont today? How closely do you follow news about the upcoming elections? Have you already voted, through early voting or absentee voting, in the state-wide primary which is being held on Aug. 9, 2016? How likely are you to vote in the state-wide primary being held on Aug. 9, 2016? Whom did you support in the 2016 Presidential primaries? 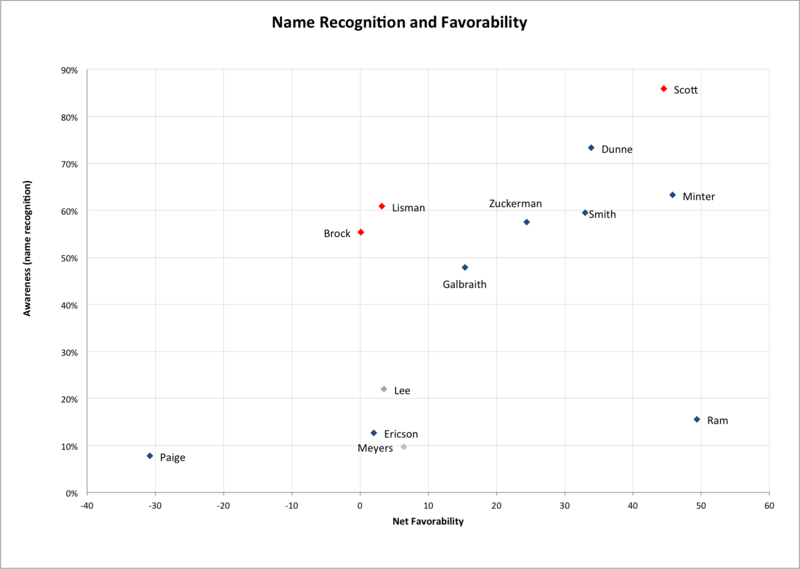 A graph showing the candidates' awareness and net favorability ratings from the latest VPR Poll, conducted in July 2016. Do you expect your household's financial situation to improve, get worse, or remain the same over the next year? If you were to meet with an unfortunate health, auto or home crisis that led to an unexpected cost to you of $3,000, how confident are you that you could recover from the loss without a major change in your financial circumstances? Would you say that housing in Vermont is generally very affordable, somewhat affordable, or not affordable? In general, do you think that your community is welcoming or not to people who come from other places within the U.S.? Thinking about racial and ethnic diversity, would you consider your community to be a place that is welcoming to diversity? Would you characterize the issue of opiate addiction in Vermont as a major problem, a minor problem, or no problem at all? Have you or someone you know been personally affected by opiate addiction? If response is 'Yes': Do you personally know someone who has struggled with opiate addiction? Overall, do you think that refugee settlement in Vermont would likely have a positive or a negative impact on Vermont? What sort of negative impact do you expect? What sort of positive impact do you expect? In general, do you favor or oppose raising the minimum wage in Vermont to $15 per hour? Regardless of the effect on personal finances of low income Vermonters, do you think that raising the minimum wage will improve economy? With whom do you most agree? Do you get the water at your home from a private well or from town water? Are you concerned with the quality of water coming into your home? Do you think education beyond high school is necessary, a good idea but not necessary, or neither necessary nor a good idea? Do you think education beyond high school is affordable to most Vermonters? Whether or not you support the legalization of marijuana, what do you think is the best process for making the decision? Do you favor or oppose holding a non-binding ballot referendum in Vermont to gauge Vermonter's support for or opposition to legalizing marijuana for recreational use? A new VPR poll shows Vermonters are divided over resettling refugees here, with significant numbers on both sides of the issue. It's the first time a VPR poll has surveyed residents on the issue. Vermont's primary election is now just a couple of weeks away. VPR wanted to understand what you know and think about those seeking national and statewide office. And what your opinions are about key issues facing the state. A new VPR poll finds that Secretary Hillary Clinton may have a tough time winning the last 30 percent of Sen. Bernie Sanders' supporters to her camp. When Vermonters were asked about issues facing the state in the recent VPR poll, there were sometimes wide differences of opinion. But people overwhelming agreed that opiate addiction is a serious issue. Those who have lived nearly exclusively in Vermont are less likely to support refugee resettlement in their community than those who have lived a significant part of their lives elsewhere.